For the past few weeks we have been focusing on building our prototypes and are ready to begin our first round of testing! 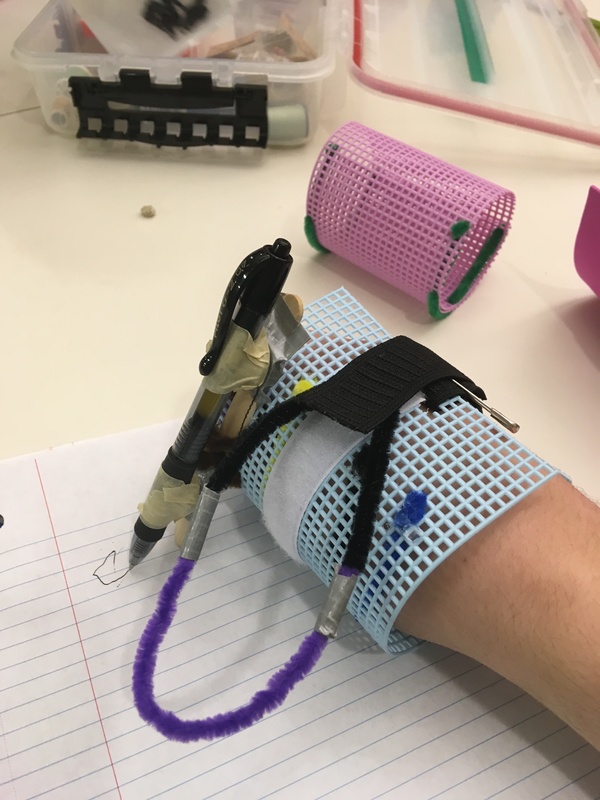 When designing this writing utensil we have kept our specific HCW statement in mind: How can we create a durable, comfortable, and modular device to assist users without the use of their fingers to write efficiently. Our current prototype consists of two sleeves with one sleeve that can be strapped on around the wrist with a pen attachment (pictured in blue) and another sleeve (pictured in pink) where the pens can be stored so that the user can easily slide the pens onto and off of the sleeve to change writing utensils when necessary. Our design focused on three key areas: the act of putting on the device, the pen attachment apparatus, and writing. The sleeve is composed of a blue mesh that can be strapped around the user’s wrist using a loop of black elastic material and velcro. 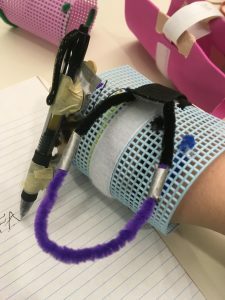 The user can use their non-dominant wrist to pull on the loop at the end of the elastic to firmly secure the mesh apparatus around the wrist area to the velcro on the outside of the sleeve and begin writing. Pipe-cleaners on the inside of the mesh act as a sort of skeleton structure and give the device a U-shape so that the user to slide the device on and off before tightening it without the use fine motor control that would typically be needed to hold the device open. The pen being used has two magnets, one on the top and one on the bottom of the pen, which are attracted to two magnets on the outer edge of the sleeve, allowing the pen to easily be snapped into place at approximately a 45 degree angle. The magnets are just strong enough to keep the pen secure while writing, but weak enough such that the pen can be slipped off of the magnet apparatus when the user is done. We hope that by using a magnetic attachment instead of the pushing motion that we had initially brainstormed our device will be able to be used by a wide range of users instead of making assumptions about their strength or mobility. While we have had a lot of success writing with the current prototype, we want to focus on optimizing the pen attachment angle so that it does not interfere with the loop. We have also found that people who are right handed prefer the pen attachment on the opposite side as people who are left handed. Our next step is to begin testing our device. We have currently assumed that that the device is learnable and that writing with the wrist is comfortable. Our users will be asked to complete a usability test after using the device which consists of a set of statements that the user can either agree or disagree with. I would use this again. I would need help to learn how to use this. I found the system very awkward to use. I would need to learn a lot to use this system.